“St Mary's Collegiate Church, Gowran, Co Kilkenny, interior - nave, blocked chancel arch, jamb of reset door,” Gothic Past, accessed April 20, 2019, http://gothicpast.com/items/show/1211. Photograph by Roger Stalley. Detail of reset door in blocked chancel arch. Capital sculpture comprises heads alternating with foliate carving showing drill hole. Capitals supported by filleted shafts and carry roll - and - fillet arch mouldings. Hood moulding has head carved label stop. 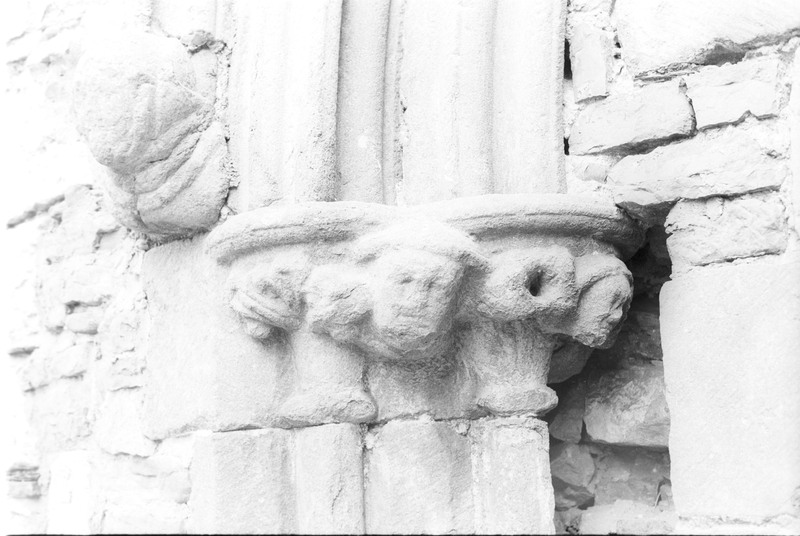 Capital design very similar to those found at St. Canice's Cathedral, Kilkenny.